If you’ve suffered an injury as a result of a trucking accident, you might be wondering what a truck accident settlement is. You may also be unsure of whether it can help you. Although a truck-related incident might seem like just another vehicle accident, they tend to be much more complicated. 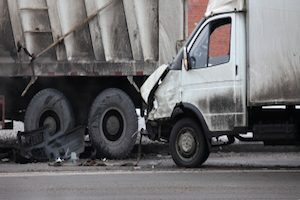 There are many wide-ranging factors to consider when it comes to trucking accidents; in fact, it is common to need insight from various experts to figure out who is at fault. If the right criteria are met, you can settle out of court. A settlement, which can come as a lump sum (paid all at once) or a long term structured payment plan, can be the answer you need. When compared to taking a case to court, agreeing to a settlement can be much cheaper for both parties involved. It can also save a great deal of time and headache by allowing both sides to come to an agreement without the strains of the courtroom. This can be preferable, even if the plaintiff ends up settling for less than they wanted. This is because the amount of money saved by not paying the legal fees associated with a drawn-out trial can easily make up the difference. A settlement also allows everyone to quickly conclude the case, helping them return to their daily lives. Given a choice, no one would rather have the stress of an impending trial hanging over their heads. Both parties must be in agreement regarding how the accident took place. The defendant must accept that he or she is at fault. Settlements rarely occur if the two parties can’t come to an agreement on this. The plaintiff likely needs to give up the right to pursue any additional claims related to the accident. The process of coming to a settlement is easier than going to court, but it’s still a complicated endeavor. This is particularly true when it comes to trucking accidents. For most people, an out of court settlement is the preferred option, but preparation is the key. Negotiations can quickly move in the wrong direction if you’re not ready. As such, truck accident victims should get in touch with a lawyer who has experience with settlements of this nature. An attorney with a proven track record can assist and guide you as you try to get the compensation you rightfully deserve. Schedule your complimentary consultation with Williams & Williams, LLC, about truck accident settlements by calling 770-823-2711 now.